In Canada’s far north, the temperature can plunge to minus 50F (minus 45C), winds can reach hurricane speeds, and winter is locked in perpetual night. This extreme climate creates significant design challenges for the new Iqaluit International Airport terminal, where passenger comfort, an efficient building envelope, and natural light become top priorities. Iqaluit is the capital of Nunavut, the territory that stretches across the eastern half of the Canadian Arctic. Although a small town, it is the legislative, commercial and administrative centre, and the hub for connecting flights to many smaller communities. There are no roads to Iqaluit – access is exclusively by air and by sea, the latter only for the brief months of summer. The airport takes on a primary role in the capital, not only as the key transportation facility, but also as a central meeting place for the community. The Iqaluit International Airport Improvement Project, currently under construction, and with a budget of $130 million, has three components: the upgrade of the runway; a combined-services building; and a new greenfield terminal building. The new complex is needed as the current terminal, dating from 1986, is too small and will be retrofitted for new functions. 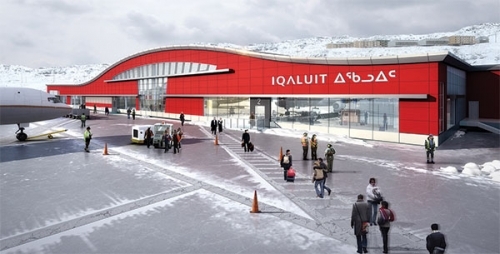 Iqaluit is North America’s first P3 greenfield airport terminal project to be constructed. Three international consortia were shortlisted for the competition to provide a package that includes financing, design, construction and maintenance and operation for 30 years. Arctic Infrastructure Partners won the bid, with Bouygues Building Canada as contractor, Winnipeg Airport Authority as operator, and Stantec as designer. The innovative, compact design proposed by Stantec was key to the winning P3 bid. Through creative passenger-flow planning, the walking distances from entrance to gate were dramatically shortened, and the area of the terminal was reduced without compromising the level of service. Furthermore, the terminal was designed so that loading bridges can serve a wide range of aircraft gauges without the need for an upper level. Stairs, elevators and escalators have all been eliminated from passenger flow in response to the relatively high proportion of passengers with mobility challenges. The design of the 10,000sqm terminal has taken into account Iqaluit’s extreme weather conditions in innovative ways. The major challenge for buildings in this climate is to avoid the heat from the building melting the frozen “permafrost” below. Many of Iqaluit’s buildings are built on stilts to let the wind blow beneath, but the terminal building is too large for that, so a system of thermosyphons will be installed under the concrete slab, which will dissipate heat in order to keep the permafrost intact. The snowfall in Iqaluit never melts, so blowing and drifting snow is a major determinant in the building form and orientation. The roof shape for the terminal is a soft continuous curve that allows the prevailing wind to scour it clean of snow, and on the lee side, wind scoops use that same wind force to direct the large drifts away from the building perimeter. The cost of energy in Iqaluit is very high, and therefore it is critical that the building be as efficient as possible. The Stantec design meets these rigorous performance criteria with high double height spaces in the middle of the building that allow the low winter sun to penetrate deep into both the public areas and the offices beyond. The central rotunda, which evokes the circular form of the igloo, is a natural public assembly space for community events, and an opportunity for the installation of art reflecting the Inuit culture. The terminal will be a dramatic and passenger-friendly building that will form the heart of this unique, remote community.